Another busy weekend, full of choices: what to do, what to leave undone, unfinished, or unstarted. It had been a busy week at school and home. For my kids – William and Olivia, it was the last week before Thanksgiving break. They get the entire week on vacation. For me, it was the end of the narrative unit and the beginning of the mystery unit and Sherlock Holmes. I like Sherlock. I like how he helps me think at a different level and I marvel at his ability to see things others do not. I know when I look at something and another person views the same picture or scene, we often walk away with entirely different perspectives. It is all about perspective. This weekend, William took delivery of his wreath order and is busy delivering it. Momma is helping, driving the car and patiently waiting while he knocks on the door, delivers the product, and thanks his customers. Yesterday, when Olivia and I were driving to help the troop, I spied a tree that still had its fruit, or nut, or whatever it is. Most of the trees here are bare. It has been cold, last week brought strong winds, and whatever leaves left in the trees were blown down. But, these trees still had their fruit. I could clearly see the bright lime green fruit among the branches against the clear blue-sky background. For years, we have collected the fruit when it has fallen to the ground. 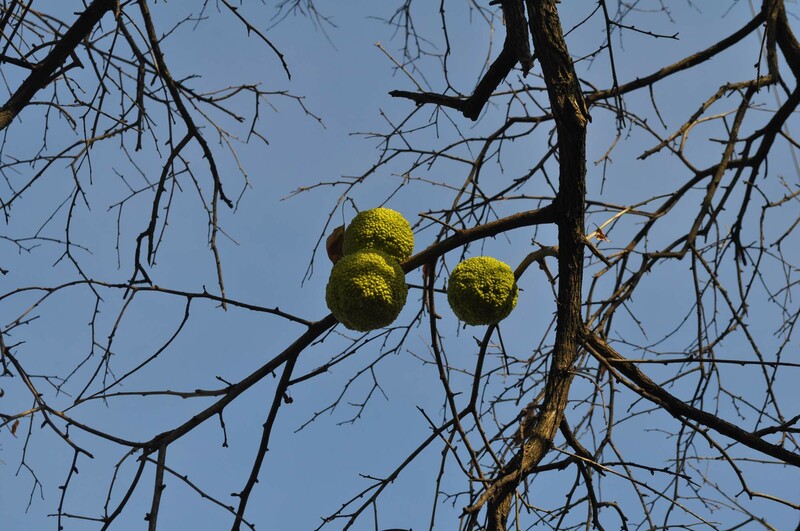 We call it a hedge apple, but really, it is the fruit of the Osage Orange tree. The hedge apple is bright green, about three to four inches across, and weighs about a pound. When it falls to the ground, it makes a resounding – thunk! On our way home, Olivia and I stopped to hedge apple hunt. There were hundreds littering the ground, but they were bruised and blemished. Besides, it was more fun to try to get the ones still hanging in the trees. We used the hedge apples on the ground to knock them out of the tree and in no time, at all we had harvested a dozen. We were pretty excited. I know I was and I could see the grin on Olivia’s face. It was a good time. William and Beth beat us home and asked, wondering, where we had been. We produced our prize as evidence and got a couple of chuckles. William, Beth, and Olivia spent the rest of the afternoon delivering wreaths before we took off for the Tiger football game. They won again and advanced to the state final for the third straight year – improbable. I remember the first game of the year when they were defeated 21-7. I never would have thought it possible. When I stop to look, to see, to take it all in – there is so much I miss. Because I am looking for things, I want to see what I am looking for, rather than see what is there. It was a great day and today is going to be a million and six times better, I know it, it is elementary my dear Watson. Making the Days Count, one day a time, one clue at a time. What can you see when you stop to look? we went back on Sunday and got ten more – it is so much fun hurling one hedge apple skyward and having two or three fall back! Olivia had a blast! Me, too! I discovered the photo carousel last weekend and applied it to the Troop’s website – I have been looking for an opportunity to try it on MtDC. Whadaya think?